The earliest surviving record for the longest baseball throw was set by John Hatfield in baseball’s pre-professional era. Hatfield was born in 1847 and apparently began his baseball career in New York in 1865. In 1868 he went west to join Harry Wright’s Cincinnati Red Stockings, for whom he played left field. In his 1998 book, “Blackguards and Red Stockings,” William Ryczek wrote Johnny Hatfield “set a record by throwing a baseball 132 yards in an 1868 exhibition,” listing as his source the Henry Chadwick Scrapbooks. (For some reason, I’m guessing because they were also used to express the distances of running events in track competition, the early baseball throwing records are given in yards, even though every measurement on a baseball field is in feet.) BaseballLibrary.com says Hatfield’s record throw came on July 9 during a field meet in Cincinnati and broke “his own record of 349 feet, done in 1865.” But the site does not list a source for that earlier record, nor does it include the event in its chronology of 1865. ADDED 9/4/17: Here’s an account of Hatfield’s 132-yard throw — shown as 396 feet — from the Louisville Daily Journal of July 14, 1868, in turn taken from the Cincinnati Times. Hatfield returned to New York after the 1868 season and thus was not a member of the first all-professional team, the 1869 Red Stockings. He rejoined the New York Mutuals, for whom he had played previously, and was with the team when it became part of the first professional league, the National Association, in 1871. Hatfield is in the front row, second from the left, in this photo of the Mutuals. Cammeyer was showing signs of desperation, and the tournament was beginning to take on a carnival atmosphere. He put up $50 in prize money for a throwing contest. 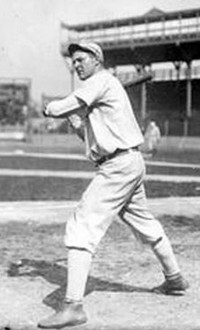 With selected players from the 3 teams [involved in the tournament] heaving the ball from center field to home plate, Johnny Hatfield broke his own record with a toss of more than 133 yards. For a long time John Hatfield has held the record of 133 yards, 1 foot and 7-1/2 inches. Ed Crane, of New York, has an unofficial record of 135 yards [405 feet], made in 1884. Larry Twitchell is said to have beaten that by 2 feet, but no official record was ever made of it. Jimmy Ryan says that Crane threw the ball 139 yards [417 feet] at Pendleton, Ohio, but did not get an official mark for it. As you can see, this item makes it appear as if Crane had become the record holder…but in a few paragraphs we’ll encounter a Sporting Life story from 1890 saying Crane’s throw, despite being longer than Hatfield’s, was not recognized as the record. Hatfield continued to be the recognized record holder. Tony’s ambidexterity on the diamond was the result of a sore right arm that threatened to end his career, after he joined Detroit. The injury resulted from his efforts in a field meet, in which he was credited with throwing a ball 416 feet 7-3/4 inches. But again, there was no date for the field meet or even a site. Mullane had played for an amateur team in Akron that year before joining Detroit in late July. Neither the New York Times nor Chicago Daily News obituaries available on Frank Russo’s The Deadball Era website mentions Mullane ever holding the long throw record, nor does it show up in any of the other biographical material I have found on Mullane. And none of the attempts to break Hatfield’s throwing record that I have read have made any mention of Mullane. However, SABR member Dennis VanLangen tells me the Lethbridge (Alberta) Herald of June 26, 1939, said Mullane threw a ball 416 feet at Oil City, Pennsylvania, on July 4, 1879. Mullane was playing with a semi-pro team in Oil City at the time, where one of his teammates was another future major league pitcher, Guy Hecker. I’m trying to track down someone in Oil City who could tell me if any record of this throw survives there. 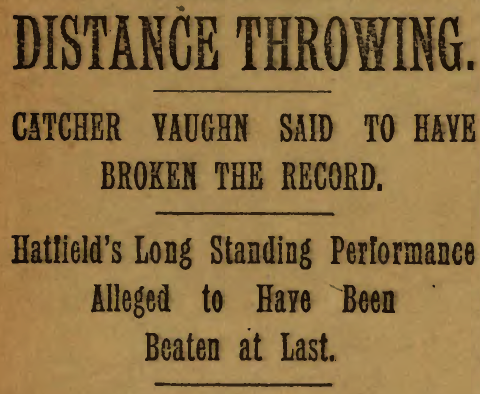 A dispatch from Buffalo last Tuesday brought the startling announcement that a long distance base ball record — that of long distance throwing — had at last been broken. The dispatch in question read as follows: BUFFALO, June 24. — Harry Vaughn, the New York Players’ Club catcher, beat the record for long distance base ball throwing at the Buffalo Club’s ground yesterday. In a contest with [Orator] Jim O’Rourke for $25 he threw the sheepskin sphere [!] 134 yds. 2-1/2 in. [402 feet 2-1/2 inches] Tim Keefe lost $5 on O’Rourke’s throw against Harry Vaughn. He bet that O’Rourke would beat Vaughn five yards. The orator’s throw was the most accurate, but Vaughn’s was the longest. It was carefully measured, and registered 134 yds. 2-1/2 in. . . . This is an astonishing performance if correctly reported, as for many years the mark set up by Hatfield has been shot at by many of the best long-distance throwers in the profession, including Vaughn, who is at last said to have succeeded in overtopping Hatfield’s great throw. Full particulars as to the conditions under which the record was made have not yet come to hand, however, and until then judgment must be suspended. The circumstances under which the trial took place may be such as to invalidate the performance as a record, just as happened with Crane’s throws in St. Louis and Cincinnati. This took place in a “programme of athletic events” on October 16, staged as a “Louisville Base Ball Club benefit” that was attended by 4,000 people. …third baseman Wagner, of the Louisville Club, made a wonderful throw, the measurers of the distance announcing that it was 134 yards 1 foot 8 inches [403 feet 8 inches], thus beating Hatfield’s throw by one yard and one-half inches. The throw was a high one. 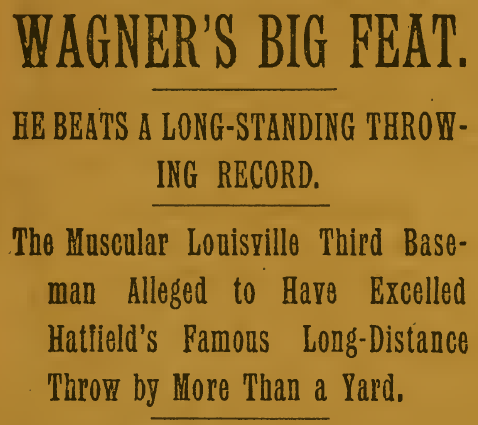 The report said, “The starting line was far out in the right-field corner, near the fence, and the 133-yard line was near the grand stand, about ten feet behind the plate.” Several players tried to break the record before Wagner, and Wagner himself made two throws that came up short but was encouraged to try again. With a tremendous effort “Hans” started the ball again, and it sailed up in the sky almost lost to sight. Finally it started falling, and the crowd along the line scattered as it hit the turf just four feet and ten inches past the record line — a distance of 134 yards, one foot and eight inches. The silence was broken by a chorus of yells that could be heard as far off as Cave Hill. When Will Douglas, the well-known sporting writer, George Decker and another gentleman who acted as judges, took the exact measurements and gave out the figures old “Hans” who, meanwhile, had come in from the field, was surrounded by his admiring friends and fellow-players and nearly had his hands wrung off. It will be many a day before such another tremendous throw will be made or anything like it. Each of the players received $60.40 from the benefit game, but it doesn’t appear any particular prize was given for the longest throw. Again, why this was not recognized as the record, I haven’t determined. Before we prepare to leave John Hatfield behind, I should point out that a note in the Sporting Life of January 9, 1904, said Hatfield was a “prosperous bookmaker” who was suing his actress wife for divorce on grounds of desertion. In the competition Lejeune was given credit for throwing only 133 yards 10 3/4 inches [399 feet 10-3/4 inches, less than two feet short of Hatfield’s record]. That the Chicago player [Lejeune was from Chicago] did set a new record is confirmed in the Cincinnati “Times-Star” by A.L. Brodbeck and Morris Longenecker, who were among the officials at the base ball field day. They have been doing some figuring since the event and have concluded that Lejeune’s throw surpassed Hatfield’s. The next part of the clipping is damaged in the digital copy in the LA84 Foundation archives, so some of the details are lost, but “a faulty system of measuring” was blamed for the mismeasurement. Apparently it had to do with the gridiron that had been laid out on the field, Lejeune’s throw landed outside the gridiron…it goes on from there, I genuinely don’t understand the explanation. But fortunately for him, Lejeune wound up smashing the record three years later. The Sporting Life of September 21, 1907, said the throws on Bowlers’ Day were made “across the wind from extreme right field toward Bleacherville in left” at the Palace of the Fans. Lejeune’s prize for winning was $100 and a gold medal. Okay, you’ll notice the Times headline gives the distance as 426 feet 6-1/4 inches, a figure that was included in other newspaper stories of the day, while the Enquirer cartoon gives it as 426 feet 6-3/4 inches. However, the Enquirer story on the same page — and remember, this happened in Cincinnati, so this is a first-hand account — says the throw was 426 feet 9-1/2 inches. [Lejeune and Faudree] started their triumphs from the extreme right field corner, throwing over toward left field, as was done at the field day three years ago when Lejeune came within less than one foot of breaking Hatfield’s old record. Yesterday there was quite a breeze blowing almost directly against the ball….Lejeune, in his first attempt against the wind, threw 385 feet 3 inches and 383 feet 4 inches. When it came time for his last trial he asked permission to throw in the opposite direction, and thus got the benefit of the fair wind which was blowing from left field to right. Referee Longenecker granted this permission and the advantage was instantly evident. On his third trial, throwing this time with the breeze at his back, Lejeune covered a distance of 401 feet 4 1/2 inches, breaking the world’s record by a little less than one foot. Seeing that it was comparatively simple to throw with the wind, he requested permission for one more trial, which was readily granted. Then came a wonderful throw, wind or no wind. By this time the young athlete had his arm warmed up and the distance gauged. Taking a running start, he swung his good right wing with all its force. The ball went high and was carried by the wind faster than any thrown ball has ever traveled before. It shot far beyond the point where the measurers were standing, and, when the distance was accurately measured, it was found to be 426 feet 9 1/2 inches, breaking Hatfield’s record by more than 26 feet. Lejeune’s performance was a grand one. All four of his throws carried well, and even on a still day he would probably have beaten the world’s record, thought not by such a margin. It is not certain whether the new mark of 426 feet will be allowed to stand, for the rule in such contests is that the effort must be made across the wind and not with it. Whether it is accepted as official or not, Lejeune is undoubtedly the greatest long-distance thrower of the day. By the way, the other field day events that day were: beating out a bunt (time); fungo hitting (distance); circling the bases (time); catcher’s accurate throwing; pitcher’s control contest; outfielder’s accurate throwing; and 100-yard dash. The Press used the erroneous 426 feet 6-1/4 inch distance (and identified his throwing opponent as Oscar Fandre, yet another spelling)…but the story also mentioned another potential record holder that I have not seen reference to anywhere else: “The unofficial record of Joe Martin of 416 feet and 2 inches was beaten 14 1/2 feet.” Who this Joe Martin was, where his throw took place and why it was considered unofficial are all unknown to me. Perhaps he was the Joe Martin who saw some action in the American League in 1903. From The Sporting News issue of May 13, 1943. This photo of Sheldon Lejeune was provided by his great-nephew Bill Pappas, who said it was from 1907…”story is that he crashed a car he bought with the signing bonus.” That would add to the list of Lejeune calamities detailed in the text. Lejeune’s Sporting News obituary in 1952 offered no information about what he wound up doing after his baseball career ended. Like John Hatfield, Sheldon Lejeune died without seeing his record broken. 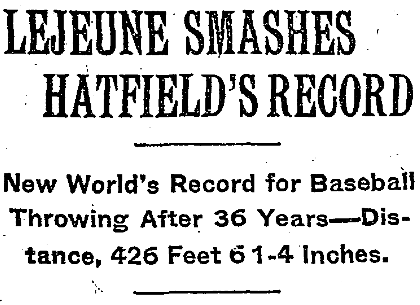 And as was the case when Hatfield died, a new record holder emerged shortly after Lejeune’s death. But the new record didn’t earn a significant amount of attention — in fact, it doesn’t seem to have been even noticed until weeks later — and it lasted less than five months. For a number of years the Helms Athletic Foundation of Los Angeles sponsored a field games competition for college baseball teams; I’m hoping to find more details about the history of the event. Events included throwing for distance, fungo hitting for distance, and circling the bases for speed. Apparently the participating teams competed on their own campuses and then submitted the results to the Helms office, after which the winners were announced. On April 24, 1952 (three days after Lejeune’s death in Michigan), as part of this competition, University of Arizona shortstop Hugh McMullan threw a ball 427 feet 1/4-inch, breaking Lejeune’s then-41-year-old record. The first mention I have found of this feat came in a column by Arnott Duncan in the Arizona Republic newspaper of Phoenix on May 17; McMullan, referred to as “Mack McMullan” in the column (and nowhere else I have found), was a graduate of Phoenix’s North High School. Helms announced McMullan as the winner of the competition on July 9, saying he would win a “special award” for breaking the record and naming him as one of 12 U.S. players who would compete against an Australian team later that summer. (I have not found anything about the results of that competition.) McMullan’s feat does not seem to have attracted any significant national attention. McMullan had a distinguished college baseball career, setting Arizona single-season and career records for stolen bases that would hold up for more than 20 years until they were broken by future major leaguer Dave Stegman. He switched to pitching in his second varsity season, 1953, and had the unusual distinction of leading the Wildcats in both ERA and stolen bases that year. In 1954 McMullan was the team’s co-leader in home runs and helped UA earn its first-ever College World Series berth. He went on to have a brief career as a minor league pitcher. McMullan apparently still holds the longest throw record in two categories: longest throw by an amateur and longest throw by a college player. A Tucson (Ariz.) Daily Citizen story of May 27, 1952 says the previous amateur record had been set by Thomas Geegan of Sydney, Australia (425 feet 10 inches in 1948), and the previous collegiate record was set by Ray Tran of Saint Mary’s College in Moraga, Calif. (411 feet 6 inches in 1939). Tran went on to play more than 1,200 games in the minors. His record throw came in a similar competition between American collegians and a group of Australians. Tran’s throw took place on the Saint Mary’s campus but I haven’t been able to track down the date; there’s a story about the competition in the San Francisco Chronicle of February 15, 1940. Runner-up in the throwing competition was a Stanford pitcher named Quentin “Cootie” Thompson, at 410 feet 6 inches. Thompson also hit a fungo more than 420 feet in the same competition. He went on to play briefly in the minors before entering military service. When Hugh McMullan’s record was broken, wire service accounts didn’t even mention him as the record holder, instead saying the old record was Lejeune’s. A three-sport star in high school, Grate went to Ohio State to play basketball. He was team captain as a sophomore in 1943-44 (the first sophomore ever to be a Buckeye captain), was selected for the 1944 U.S. Olympic team (although the 1944 Olympics weren’t held due to the war), then returned to Columbus for his junior season. In both his seasons the Buckeyes reached the semifinals of the NCAA tournament (which in those days had only eight teams participating), and Grate made second team All-America as a forward both years. Grate married an Ohio State classmate on September 1, and the next day Utica fans took up a collection for the newlyweds and gave them $281.37 (according to The Sporting News of September 13, 1945). In his final appearance of the season for Utica, he pitched 14-1/3 innings in a loss to Albany that knocked the Blue Sox out of the playoffs. Grate returned to the Phillies late in the season and pitched in a total of four major league games in 1945, two of them starts. Sent back to the Utica for the full 1946 season, he went 14-8 for a team that finished 21 games under .500. He also pitched another eight innings for the Phillies and picked up his only major league victory, but Grate never returned to the big leagues. He thought his arm was never the same after a late-season injury. After the 1946 baseball season, Grate signed with Chicago of the new professional Basketball Association of America. He did not wind up playing with the Stags during the season, but he did play 11 games for the Indianapolis Kautskys (thanks for fixing that for me, Phil Lowry) of the National Basketball League in 1947-48. After he was released by Indianapolis in December he played for the Columbus Mariners (a member of the All-American Professional Basketball League, then in its only season of existence) and later took the Kautskys to court, saying he was still owed $3,161.49 under his contract. 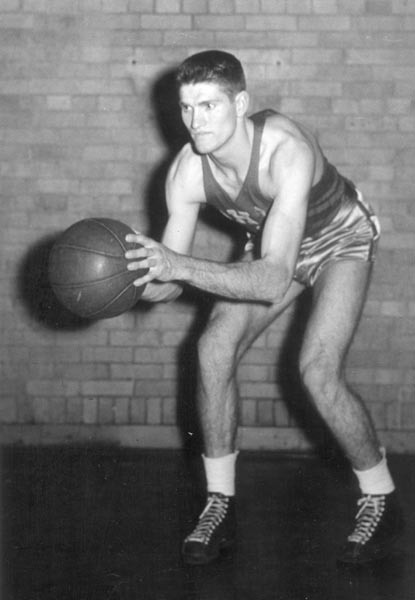 His pro basketball career concluded with two games for Sheboygan of the National Basketball Association (formed by the merger of the BAA and NBL) in 1949-50. But baseball remained Grate’s primary sport. He opened the 1947 season at Memphis in the Southern Association, a step above Utica. He threw a 12-inning complete game to defeat Mobile, 3-2, in the season opener, but lost his next four games and went back to Utica for the rest of the season (and helped the Blue Sox win another pennant), then the Phils gave up on him and sold him to Louisville after the season. After that he spent some years bouncing around: Louisville and Milwaukee in 1948, Dallas and Milwaukee in 1949, Hartford (back in the Eastern League) in 1950. After the 1950 season Grate took up high school teaching and coaching. He got a job at Brown High School in Kilbourne, Ohio, and a note in The Sporting News issue of January 3, 1951, said his basketball team was off to a 9-0 start with an average margin of victory of 17 points. Grate’s recollection in that 1952 interview was that he hit inside-the-park homers his first two times up and was from then on an outfielder. I found a story in the Baton Rouge (La.) State-Times of July 11, 1951 mentioning Grate hit two inside-the-park homers the previous night in a 15-7 loss to Memphis. He finished the year with a .330 batting average in 221 at-bats, leaving the team just before the end of the season to start a new teaching and coaching job near Columbus. Grate’s performance earned him a trip to spring training with the Washington Senators in 1952 (hence the story by Povich), but he was returned to Chattanooga after being “handicapped by a bone bruise that affected his batting grip,” according to The Sporting News. 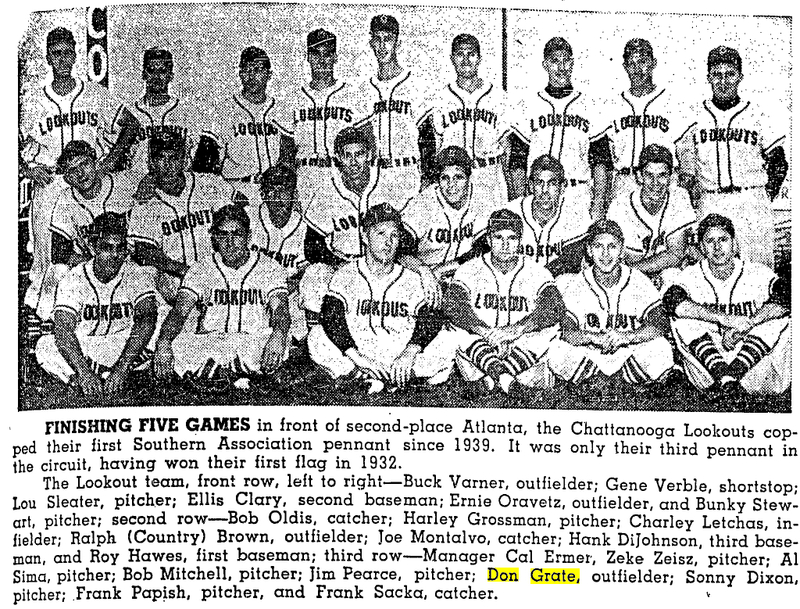 It was a good season for the Lookouts, who won the Southern Association pennant for the first time in 13 years under 27-year-old manager Cal Ermer, who later managed the Minnesota Twins. Grate was a regular for the full season for the first time in his career and batted .295. 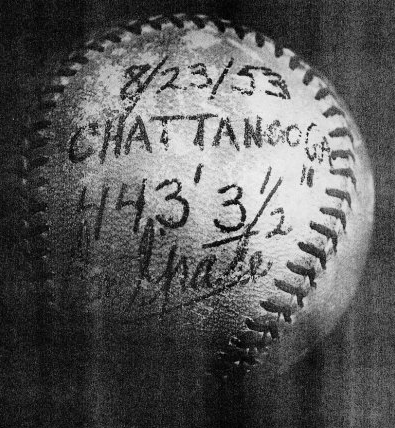 And on September 7, before the final game of the season, he made history at Joe Engel Stadium, throwing a ball 434 feet, 1 inch in a pregame exhibition. I don’t think Mrs. G grabbed a whole lot of fivers that summer, as Don hit .295 again. And along the way he extended his throwing record, with a heave of 443 feet 3-1/2 inches before a doubleheader against Little Rock at Engel Stadium on August 23. Allan Morris, writing about the event in The Sporting News, said Grate got a running start, adding, “The record-smashing heave was the last of five throws made by Grate from the center-field flagpole toward home plate.” Grate went on to play both games of the doubleheader. By this time Chattanooga was home for the Grates; an item in the September 2, 1953, Sporting News said Grate had accepted a job as basketball coach at Notre Dame prep school in Chattanooga for the coming winter. And he spent the next two summers with the Lookouts, batting .301 in 1954 and .295 in 1955. Grate was bumped up to Class AAA for the first time in seven years in 1956, going to the Senators’ affiliate at Louisville. Early in the season he was traded to American Association rival Minneapolis, and it was as a Miller than he would achieve his longest throw ever. But first there would be a challenge to his record. Rocky Colavito established himself as one of the top power-hitting prospects in the minor leagues by hitting 96 home runs over three seasons, 1953-55. 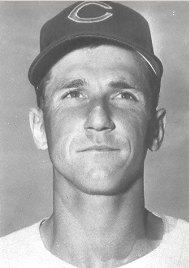 After getting a cup of coffee with Cleveland at the end of the 1955 season, he made the team out of spring training as a 22-year-old in 1956 and got a shot as the starting right fielder a week into the season. It was an inauspicious start for the highly-touted rookie, who got only 5 hits in his first 43 at-bats. Things had to get better, and did, but Colavito didn’t pull his average above .200 until early June and was hitting .215 when the Indians decided to send him back to the minors, to San Diego, to get straightened out. Colavito, touted as the strongest throwing outfielder in baseball, will attempt to throw a ball 460 feet — the measured distance between the left and right-field foul poles. Great throwing arms are scarcer than Padre home runs, but I believe we have the greatest throwing arm in the history of baseball on our Padre club. The owner of this fantastic arm is Rocco (Rocky) Colavito. Rocky can’t explain why his arm is so much stronger than that of the average baseball player, and neither can anyone else in baseball. I do know that his arm is unquestionably the strongest I have ever seen, and I have had the pleasure of seeing the best in the world in recent years….I have never seen him lose a bet on his throwing ability. Hampered by a crosswind, Colavito made the first two throws from the left field foul pole to the right field foul pole, his longest effort going 415 feet 7 inches. Moving behind home plate to take advantage of the faint breeze, the Cleveland optionee pegged his last three throws over the low center field barrier, 426 feet away. The 435 foot 10 inch throw landed in the enclosure behind the fence and struck the scoreboard on the first bounce. There was no reference in the Union to an unmeasurable throw landing on the batting cage, as mentioned in the book cutline above. 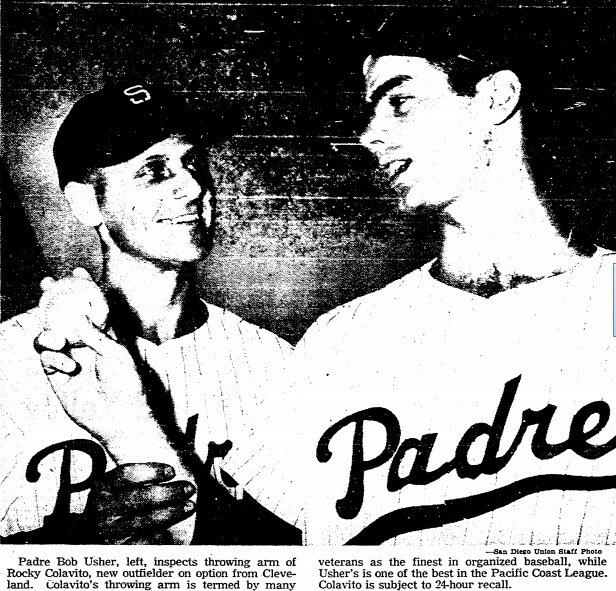 Colavito hit a home run in each game of the Padres’ doubleheader against the San Francisco Seals that day; the throwing exhibition came before the games, not between games as the above cutline states. The Millers were playing their first season outside of Minneapolis; their new home was the brand-new Metropolitan Stadium in suburban Bloomington, a ballpark that was built to try to lure a major league franchise, then was expanded when that effort attracted the Washington Senators to become the Minnesota Twins in 1961. Grate’s throwing exhibition was just one of the attactions that night, according to the Minneapolis Tribune: “Gil Coan, with a 20-yard handicap, won his 80-yard race with a horse….Because of motor trouble, the helicopter did not drop the baseball from 600 feet to catcher Vern Rapp.” More than 10,000 people were on hand to see Grate throw a ball 445 feet 1 inch, throwing from the center field fence toward home plate. The account at left that appeared in The Sporting News was written by Minneapolis sportswriter Halsey Hall, who had served as emcee for the night’s festivities. “Grate made five throws before cracking his old record…A gate in the wire center field fence was opened to give him running space. The fence is 405 feet from the plate. Grate took a six-step run each time. His record throw landed in the gof bag of trick shot expert Chuck Lewis which rested on the ground just in front of the box seats.” Here’s how Grate recalled it in 2006: “The ball I threw in Minnesota hit on the backstop [behind home plate] so they just measured to the backstop, which was 445-1. The ball should have gone further, and that ball should go into the record books.” That could jibe with the description written by Hall, if the golf bag was in front of the backstop and the ball went into the bag above ground level, but the throw was measured only to the bag, Grate would have been cheated out of a little extra distance the ball would have covered before hitting the ground. I wish Hall’s description had been a little more specific, but the golf bag situation wasn’t even mentioned in the following morning’s Tribune (although Chuck Lewis did get a mention). Grate’s record was toppled the following year by Glen Gorbous, a 27-year-old outfielder who was playing in the same league as Grate with the Omaha Cardinals of the American Association. 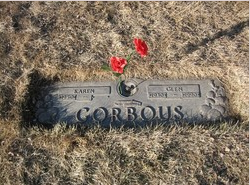 Gorbous grew up playing baseball and hockey in Drumheller, Alberta, northeast of Calgary. He moved to Vulcan, about 100 miles south, at age 16 when his father opened a furniture store there. After graduating from high school in 1948, Gorbous went to a Dodger tryout camp in Calgary and earned a contract for the following season. He topped the .300 mark in four of his first five minor league seasons, then after hitting .283 with 16 homers at Fort Worth in 1954 he was drafted by the Reds and made the major league team the next year. His major league career was not long or terribly successful. Traded to Philadelphia at the end of April 1955, he hit .237 in 91 games with the Phillies. He played only a handful of major league games in the next two years before the Phils traded him to St. Louis in 1957. The Cardinals assigned him to Omaha, where he played for Johnny Keane. Gorbous still couldn’t get his bat going, and by late summer Keane was working to teach him how to pitch, as Gorbous thought that might be his best chance of getting back to the majors. As a prank and to amuse his teammates, Gorbous says he used to take aim at the Omaha ballpark’s distant floodlights and knock out the bulbs. “It was costing a fortune to replace the lights. So management came up with a scheme which, they hoped, would bring some people into the park and provide a constructive outlet for this uncontrollable urge I had to grab a baseball and — pling! — throw it at just about anything…. He went into training, warming up with the catchers before each game…He began thinking about the techniques of throwing for distance. He would hold the ball over the top with fingers on the cross-seams to create a vacuum when it was released. A teammate, Whitey Ries, had thrown a javelin in high school and advised him to take a good run, rear back and throw with an overhand motion as if he was throwing a javelin or spear. Several elements of the account of Gorbous’ record throw in the 1988 story differ from what was reported at the time in the Omaha newspaper (shown at left); given a choice between memories 30 years after the fact and a contemporaneous account, I’ll go with the newspaper. But both accounts agree that Gorbous was allowed a running start on his throws and that it took a few tries before he broke the record. In 1988 Gorbous said he got advice from Ries after his initial attempts fell short, with Ries telling him to throw the ball higher; after all, Gorbous didn’t need to get the ball to its destination as fast as possible to throw out a baserunner, he was trying to throw it as far as possible. And on his fourth try, Gorbous broke Grate’s record by nine inches, with a throw measured at 445 feet 10 inches. No one has had a throw measured that long since; in fact, I have not found evidence that anyone has ever formally tried. Gorbous did not play in the game the night of his record throw. “Oh, my arm hurt,” he said in 1988, “Next morning I couldn’t even comb my hair.” But four days later Gorbous made his Omaha pitching debut, throwing four innings in relief against Charleston (W.Va.), allowing just two hits and one run (which scored on a wild pitch). Six days after that he was used in relief again, going two innings against Wichita, but that would be his last appearance on the mound. Gorbous played in Spokane in 1958. Jack Sheehan, later a columnist for the Las Vegas Sun, attended the Indians’ home opener and wrote about it in a 2007 column. Before the game started, a Spokane outfielder named Glen Gorbous performed an astonishing feat. He threw a baseball from home plate over the center field wall, 410 feet away. It took him three tries. On the first two, the throws fell just short and bounced off the Pete’s Perma-Mulch sign. But on the third, as he was going through a motion like a coiled shot-putter under attack by killer bees, Gorbous gave a grunt that carried all the way to our seats in the right-field bleachers. The ball exploded from his hand and hung suspended in the air for hours. With it hung every boyhood dream I’d ever had. Then, finally, it disappeared over the fence. The crowd erupted in a huge ovation. I didn’t stand up; I would have been a small pine in a forest, but I couldn’t have been more awestruck had I witnessed a spaceship land on second base. Alas, Gorbous needed arm surgery that summer and retired the following spring. He went into the furniture business with his father in Calgary; later he worked for a company that supplied portable housing and catering for remote areas in the field for an oil and gas-exploration company. His son-in-law, Michel Petit, was a first-round pick in the 1982 National Hockey League draft and went on to play parts of 16 seasons in the league. This ad appeared in the Calgary (Alberta) Sun in 1988…thanks to Wild Rose Baseball for posting it! 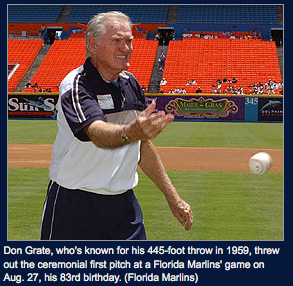 As for Don Grate…he played one more season after his record toss, batting .296 at Minneapolis in 1957 and setting career highs in home runs and triples. But when the Giants didn’t offer him a major league contract in 1958, he decided to retire from baseball. Grate earned a master’s degree and continued teaching. He moved to Miami in 1963, retired from teaching in 1988, and passed away in 2014 at age 91 (SABR member Nick Diunte has more about his life here). In 2006, the 50th anniversary of his longest throw in Minnesota, the Florida Marlins invited him to throw out the first pitch before their game against Milwaukee. Okay, so the caption on the MinorLeagueBaseball.com site put Grate’s longest throw in 1959 instead of 1956. It figures, since so many facts surrounding the longest throw records seem to have been slightly off through the years. This entry was posted in Baseball on December 4, 2009 by prestonjg. Great research on the longest throw records. 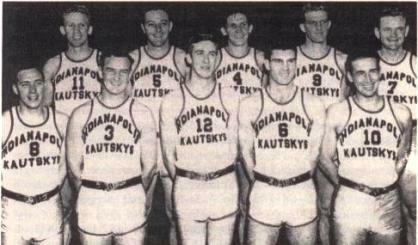 One comment – the Indianapolis basketball team was nicknamed the Kautskys, not the Katuskys. Good luck on discovering more info. I have done similar research on ballparks and on marathon long games. You are correct sir! I will fix that up right now. Thanks for reading and commenting. Nice article and good job researching this fascinating subject. Welcome to SABR! Very well done, indeed. I learned a lot. Good work, and welcome to SABR, J.G. Around 1985, there was a great little book called Michelson’s Book of World Baseball Records. It included a chronology of the longest throws, ending with Gorbous. I don’t recall if Michelson had any you didn’t, or vice versa. Thanks, Bill. I’ve just made a request for the Michelson book through interlibrary loan at my public library, so I’ll look forward to getting my hands on that! Enjoyable, interesting piece of snooping–thanks! I recall reading a story somewhere about several more recent players getting into an informal throwing contest. If memory serves, Dave Parker, Dave Winfield, Andre Dawson, and one more player were trying to one-up each other throwing from right to home… perhaps before an All-Star game? Curious if any of those or other recent players (Ichiro?) have taken a shot at the long-distance record. 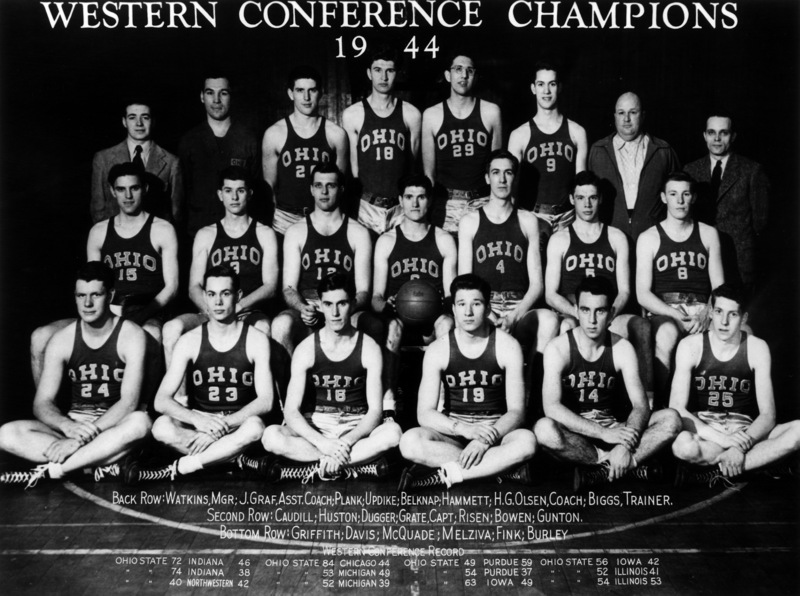 No, the reference to the Basketball Hall of Fame was in regards to Grate’s Ohio State teammate Arnie Risen, who was sitting next to Grate in that team photo. Don Grate was inducted in the Ohio State University Hall of Fame for Basketball. Go to the arena and check it out. He also has a star on the walkway at The Buckeye Cafe in Columbus Ohio. Hi Marnie…are you related to Don? Don Grate was inducted into The Ohio State University Hall of Game. If ever in Columbus check out the Shottenstein Arena 1st floor… quite a collection of athletes hail from Ohio State. Whatever happened to the ball Gorbous threw? I was just wondering about more recently. Has anyone attempted to break Glen Gorbous record since the 1950’s? Have any more events been held? Hi Kevin–In all my research on this topic, I have not found any reference to any conscious, measured attempt to challenge Gorbous’ record. Gorbous’ record itself received what I find to be surprisingly little attention, maybe interest in the topic just dried up. You do wonder why there weren’t at least a couple more attempts to break the record. If I ever do learn of any I’ll be sure to amend this post. As a senior in high school, without a run up I could throw a softball over 100 hundred yards. A few years later and not really being in good baseball shape I threw a baseball 350 ft and it landed on home plate. Many years later my grandson also measured a throw of his when he had not played in a couple of years. I measured his throw with a hundred foot tape and it came out a little over 375 ft. I had always guesstimated in baseball shape probably could have thrown maybe 425. Neither of us had ever imagined the record being that close. I have a friend who said he meant a man who had taken part in a baseball throwing contest. He said his best throw was 450 ft and had not even come close to winning the contest. We don’t have these kinds of contest for distance throwing like the contest for women in the 50’s for throwing a softball at track and field events. Consistently when folks estimate distances, especially when Ego (self, kin) are involved, things are overrated. It is doubtful that being in better “baseball shape” could add 75′! But highly implausible is the 3rd hand(!) account where supposedly a guy threw a WORLD RECORD distance & did not even come close to winning. You gotta be kidding me. If you consider wind conditions & elevation, Rocky’s something over 435 10″ “unmeasurable” throw was the best ever in true distance. And he seems to only have been able to try on one occasion. He is the only man who under neutral conditions likely could have thrown a full 450′. Though theoretically a few of the fastest pitchers ever should be able to contest the top distances. The distance a person can throw a baseball is completely separate and mostly unrelated to how fast they can throw from 60 feet away. It’s even largely unrelated to the velocity of throwing out a runner from the outfield. The technique of pitching is what allows some people to throw 100 mph, and it has little to do with being stronger than anyone else. Most of the strongest men in the world couldn’t throw a ball faster than 70-75 MPH. And because of the trajectory of the throw used to get the most distance, it has little in common with throwing in a straight line for velocity. I was playing Pony League in Pacific Beach in 1956 and had won 2 front row seats behind the backstop right behind the catcher for selling the most tickets for a pancake breakfast to help our league. My coach and I were there when Rocky started his quest. His first throws were from behind home plate and when his throw landed on the cage behind the center field wall he then moved to the right field corner and attempted to break the record form right field to left field corner I always remembered that Rocky had hit more than 2 home runs that afternoon. Great to see the photo of his attempts and knowing I was right behind him when her launched those rockets. I remember Glen from his days as a Phillie. I remember it was always mentioned on radio and TV what a gun for an arm he had. If I am not mistaken they at one point they had him throw from center field in Shibe Park (over 400 feet) as part of a demonstration. I was looking him up tonight and stumbled onto your site and got details I never knew. Nice read re the artical. Baseball is timeless. What a wonderful sport. What a wonderful person and baseball player Mr. Colavito is and was. Yes, that was a memorable day when he made his throws. I had a great view as I was on the field (Lane Field) that memorable day. I grew up near Pittsburgh and saw many games at Forbes Field. This park had one of the largest outfields ever. At it’s deepest spot was 457 feet near the flagpole in left-center. A little toward center was “the monument” . Don’t remember what the monument memorialized but I think it may have had something to do with Babe Ruth’s last 3 homers in the major leagues. I do not remember how ar this monument was from home plate but it had to be in the 430-450′ range. I never saw this happen, and I only heard about it in the usual Pittsburgh urban legend but Roberto Clemente was supposed to have thrown a strike to home plate from just in front of that monument during practice oneday. Don’t know what year this happened and never saw it confirmed in print, just hearsay. I’ve won 2 hit and throw contests in my life, and thrown a baseball well over a 325 fence a few times, thrown a football around 80 yards and landed it in a trash can i had picked for it to land in…only 1 person has ever beat me and im 25 now, 23 at the time and it was by an 18 yr old kid, kid had potential…they need to have events like this around, i’d take part def. Great article….fantastic research. Thank you for sharing this. A Great story, with fantastic research. I was happy to learn that two players from my favorite team, the Philadelphia Phillies broke the existing records (Grate and Gorbous) and that one of them still holds it (Gorbous). Richie Ashburn always said that Gorbous had the best outfield arm of anybody he ever saw play for the Phillies either as a teammate or during his Phillies broadcasting career. Now I know why! It also says at that site that, “The record for the fastest time for circling the bases is 13.3 seconds, set by Evar Swanson at Columbus, Ohio in 1932.” I find it hard to believe that no one in the last 81 years has broken that record. Would you like to research that topic? I was timed circling the bases as a high school freshman in 16 seconds when I was 7 inches shorter in height than I was as a senior, and I wasn’t all that fast a runner. Hard to believe that Mickey Rivers was timed in 14.3 seconds. I once saw Colavito throw from deep center field in old Tiger Stadium on a play in Detroit during a twi-night double header with the White Sox in the sixties. Since the dimensions at Tiger Stadium were 464 to deep center the throw must have gone at least 450 feet. What a sight! Great article, Prestonjg. As air is less dense when it is hot and humid, Gorobus’ throw had less air resistance to overcome than Grate’s. So, yes, I agree that Grate’s accomplishment may have been even more impressive. This why more homers tend to be hit in the hotter months. In regard to Thomas Geegan, he played winter baseball in Sydney with Western Suburbs, and cricket for Balmain in the summer. He was negotiating to travel over to the US to try out with the Boston Braves in spring training for the 1949 season. Played ball with Bob Arrighi in Rhode Island independent league in 1968. He still could throw hard for 2 innings pitching. Even though he had injured his arm in 1961 , he would still challenge guys to throw balls over the center field fence for bets. I was his catcher for Lincoln, Rhode Island. My name is Kandace and Glen Gorbous is my grandfather (my mothers father) This was awesome to read. Thank you for sharing! Thank you, Kandace. I’m so glad you left a note! I just saw a highlight reel throw tonight made by A’s rookie Ramon Lauriano which sent me down a rabbit hole trying to find the longest throw in major league history. That led me to your fantastic article. Thank you so much for doing such amazing research and then sharing it with the world. People like you are what makes the Internet great. As I was reading your article, you mentioned that you haven’t found anyone who has tried to break the record since. I was wondering if this might have to do with the potential damage that trying so hard to throw that far might do to a major-league players arm. Gorbis required surgery the year after he broke the record. Is there any evidence that going all out to push your arm to its absolute limit can cause lasting damage? I’m curious whether modern trainers discourage players from doing this sort of thing. Just wondering what your thoughts were on this idea. In your research, did you find any information on the longest throw ever made in a major league game? With the pressure of a game situation, and the need to be accurate, I wonder what the best throw was ? I haven’t, but I think there are a few anecdotal candidates out there. Are you still writing baseball articles?